Data from India is NOT back! Previously, we posted about a new data source for Indian AQ data. Unfortunately, this data source is unusable for our platform. The same physical air quality measurement in two different countries could produce two different Air Quality Index (AQI) values because it is changeable national-level policy applied to scientific information — not the scientific information itself. Scientists, activists, journalists, policymakers and others need access to physical air quality data. As it turns out, the Indian Open Data API is not sharing real-time physical air quality data. 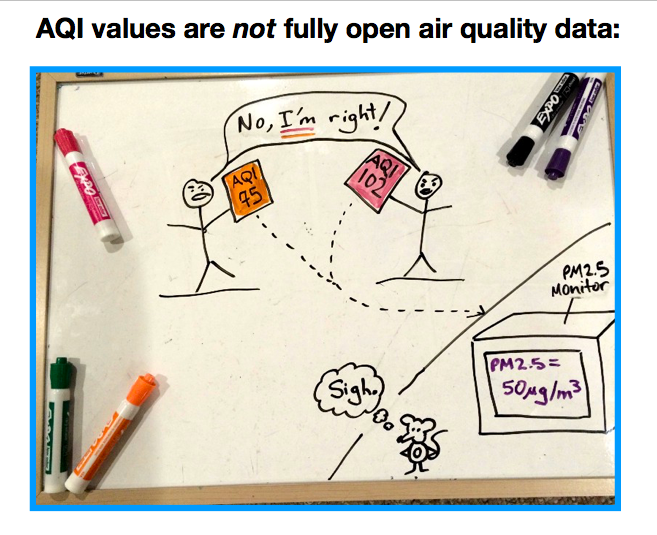 Instead, it is sharing Air Quality Index values. In short, Air Quality Index values vary from country to country for public health messaging; they are not the physical values an air quality monitoring instrument measure, nor what one would use to model mitigation efforts, conduct a public health study, or do rigorous work in the air pollution space (more on why this matters). Because the raw data are not shared in an automatic, real-time manner and the limitations this puts on downstream use-cases of the data, this means that we do not consider the Indian Government air quality data fully open or accessible enough for our platform. This also means we must stop accessing this data source, remove the data, and look for a new data source. We were thankfully alerted to this issue by a community member, Sarath Guttikunda, at Urban Emissions.